Among the numerous markets in Chiang Mai, one of the most well known is Warorot Market (ตลาดวโรรส), located right in the center of town. 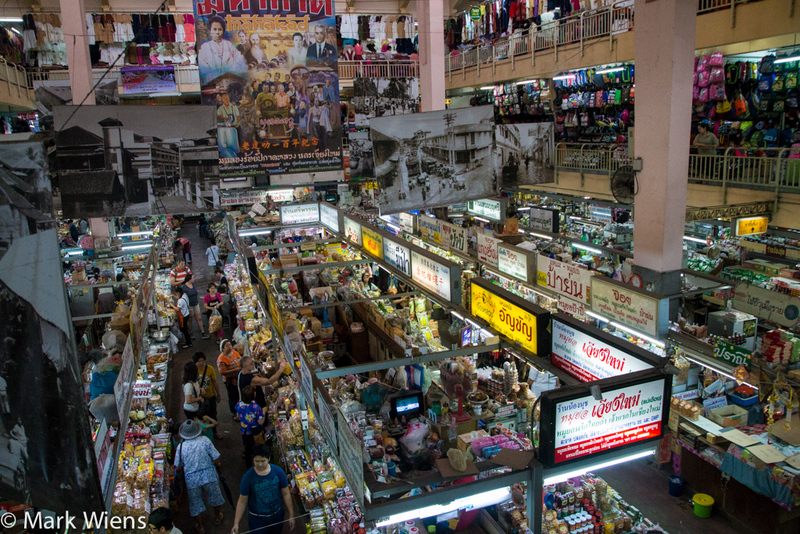 The market is a historical landmark, a long standing market, known for its variety of speciality Chiang Mai food and products. Warorot has an old-school Chinese Thai feel to it (the area is known as Chiang Mai’s little Chinatown). The facility is pretty old looking, and that’s partly what makes it such a classic market to visit. 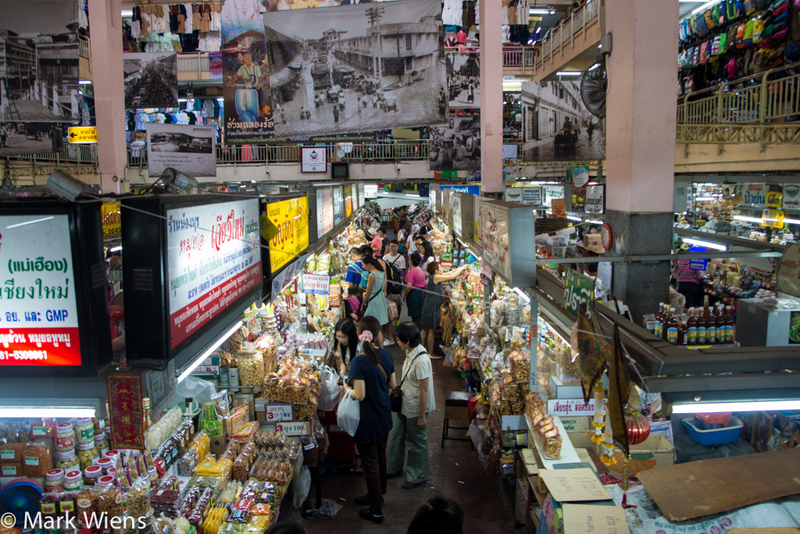 I would consider Warorot Market to be sort of like the Chiang Mai version of London’s Borough Market, a place where you’ll find artisan preserved meats and speciality snacks, and where you’ll find many tourists walking around and eating. There are actually two parts that make up the market: Warorot Market (ตลาดวโรรส) and Ton Lamyai Market (ตลาดต้นลำใย). 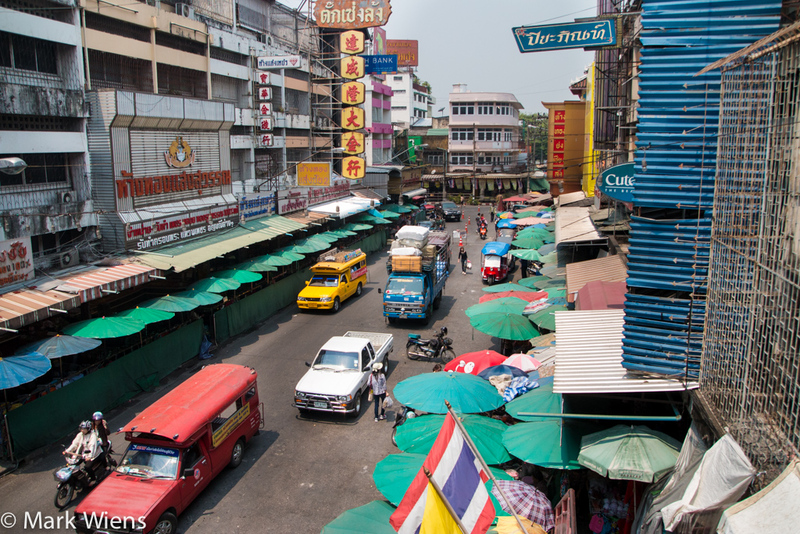 Facing in the direction of this photo (above), which is somewhat facing northwards, Warorot would be on your left hand side, while Ton Lamyai Market is on your right hand side. They both pretty much look the same, and even inside, they are quite similar. I’m not sure the history, how they are different, or how they have different names, but it’s sort of like two markets in one, separated only by the road. 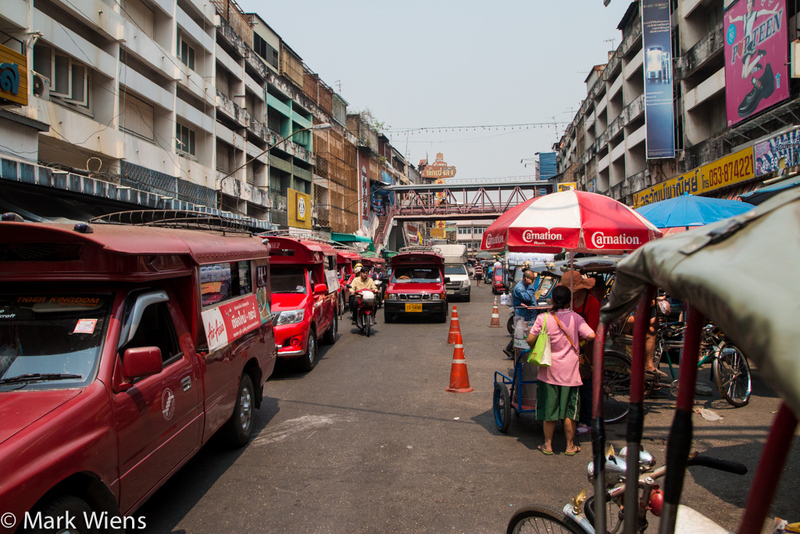 You could also spend hours walking around the outside surrounding areas of the market – there alls sorts of make-shift vendors, and lots of street action. 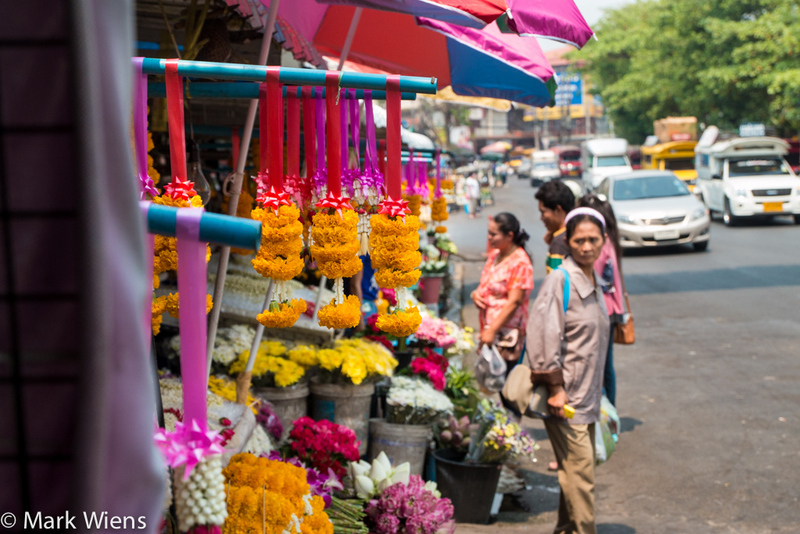 On the east side, you’ll find vendors selling a pandemonium of flowers, sort of like a miniature version of Bangkok’s pak khlong talad flower market. It’s on the outside of the market, along the outer edges and along the sidewalk, where you’ll also find much of the fresh produce like fruits and vegetables. 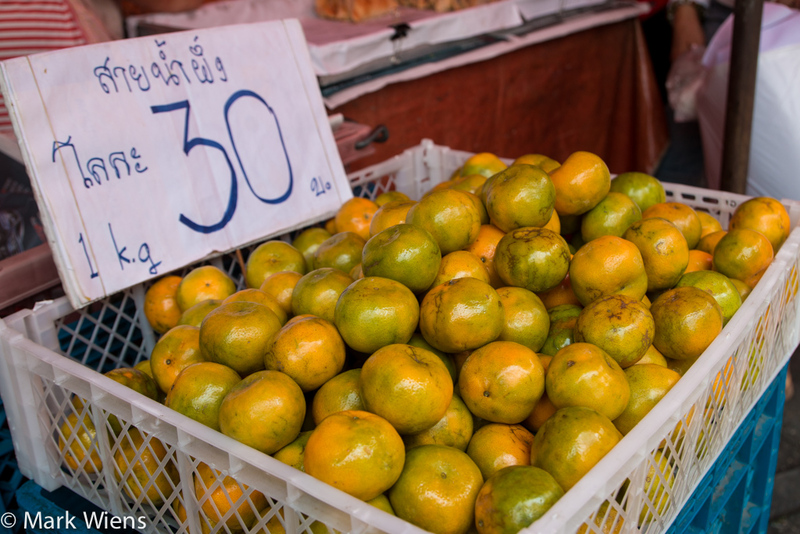 Depending on what season you visit Chiang Mai in will largely determine what fruits are available. 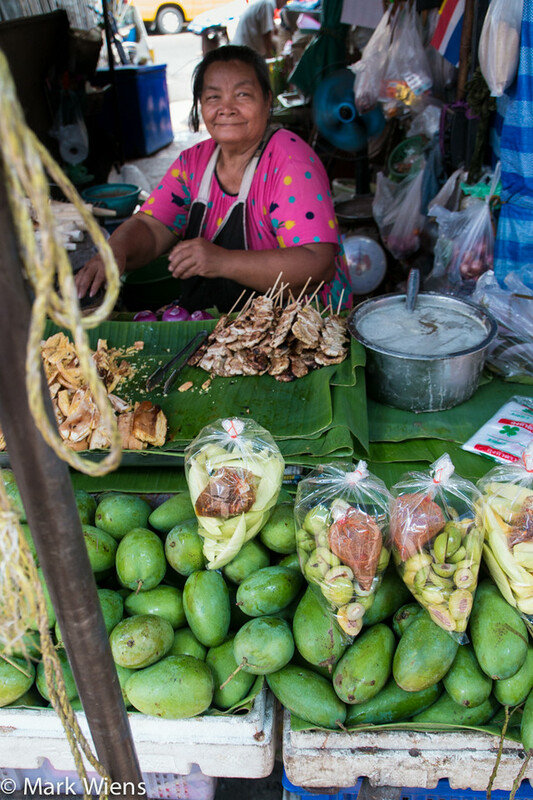 On the outside of the market, you can find all sorts of interesting ingredients that you’d need to cook a full Lanna feast. 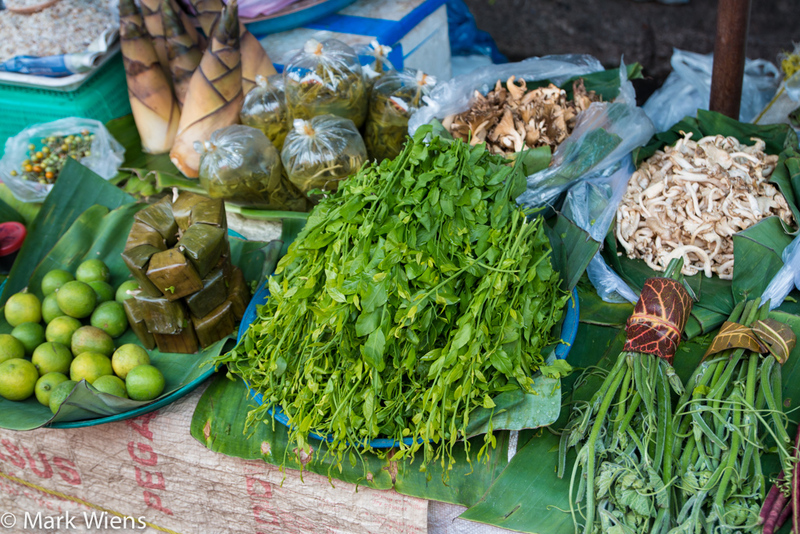 There’s a variety of different herbs, mushrooms, and ingredients that are not commonly found in Bangkok, but only in the northern areas of Thailand. Ying and I bought a bag of sour ma prong awn (มะปรางอ่อน bouea macrophylla) from this friendly lady as we were walking around the outside of the market. Ma prong awn (bouea macrophylla, that’s the English scientific name) are one of the most insanely sour things ever, similar to a sour green mango, but more sour. When you take a bite, your face will shrivel in sourness. You normally dip it into a salty sauce made from shrimp paste and chilies. Warorot Market is perhaps more famous than Ton Lamyai, as in, if you just mention you’re heading to this area in Chiang Mai, you’ll say you’re going to Warorot and everyone will understand (even if you’re going just to somewhere in the area). Pass through the rows of fruit vendors along the sidewalk, and the market opens up into multilevel old-school mall. The upper floors are filled with mostly clothes, but the bottom floors are dedicated to food. 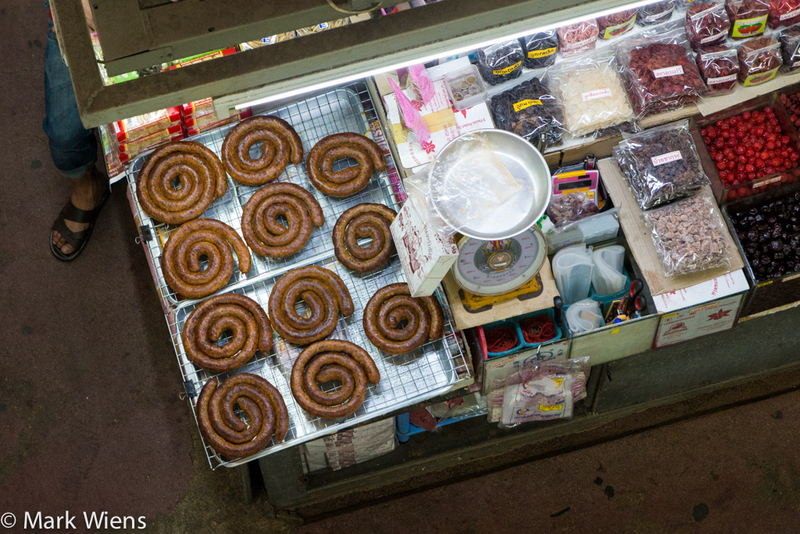 Coils of “sai ua” sausage, view from above! Any Thai person from Bangkok who visits Chiang Mai has an unwritten requirement to bring back sai ua (northern Thai sausage ไส้อั่ว), cab moo and nam prik noom (pork rinds and green chili dip แคปหมู น้ำพริกหนุ่ม), and moo yor (steamed sausage loaf หมูยอ). 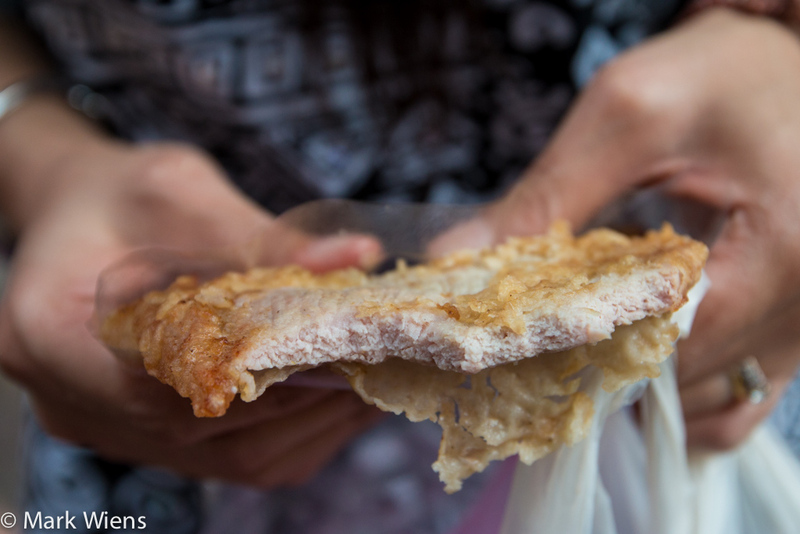 Failure to bring back any of these snacks, and it’s as if you never went to Chiang Mai. Warorot is filled with an abundance of speciality Chiang Mai snacks, many of the items already packaged and ready for takeaway. One of the most famous food stalls in Warorot Market is Dam Rong (ดำรงค์), a place that specializes in both sausage and fried pork. They also have a few other items, but I’m guessing 90% of the people that wait in line, go for just these two meats. No matter what time of the day you go, there’s nearly always a handful of people waiting in line. After seeing the crowd outside Dam Rong (ดำรงค์), I decided we may as well get in on the action and see for ourselves what was so good about this fried pork stall at Warorot Market. I decided I needed to try both of their specialties. Their sai ua (northern Thai sausage ไส้อั่ว) was steamed and piping hot, but it was on the plainer style, with much less lemongrass and chilies than in other versions that I really like. It tasted more like a Chinese sausage, really fatty and porky with not a lot of seasoning. It was still good, but not my preference for sai ua. Fried pork (หมูทอด moo tod) is common and available at nearly every other street food stall around Thailand, and it all usually tastes pretty similar (there are a few different styles though). So when my wife Ying mentioned that the fried pork was really famous at Dam Rong (ดำรงค์), I didn’t get as excited as if it would have been something more complex like khao soi or something like that. 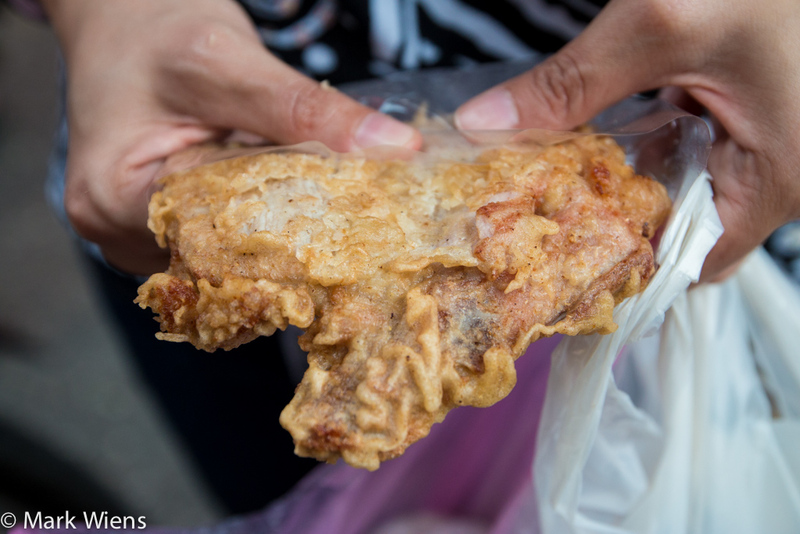 Rather than being bite sizes pieces, their fried pork was cooked in a full fillet of meat, battered, which is not common in Thailand with pork, and then deep fried. Though simple and plain, and not even crispy, it was somehow incredibly delicious. The meat itself was tender, and the egg batter was just the right saltiness and seasoned with a good hint of black pepper. If you love pork, it’s not a bad idea to grab a few pieces to eat while you walk around. After snacking on the sai ua and fried pork we decided make the trip to other side of the street to go check out Ton Lamyai market. 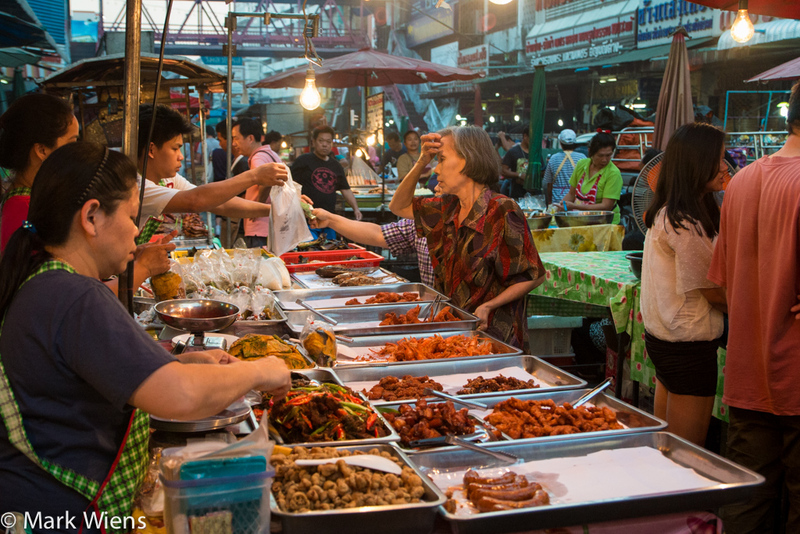 This side of the market is virtually the same as Warorot, with mountains of Chiang Mai snacks, including everything and more that you could ever want. At Ton Lamyai there’s also tools, cooking supplies, clothes, and huge random assortment of everything else. The main indoor section of the market is open only during the day, and closed at night. 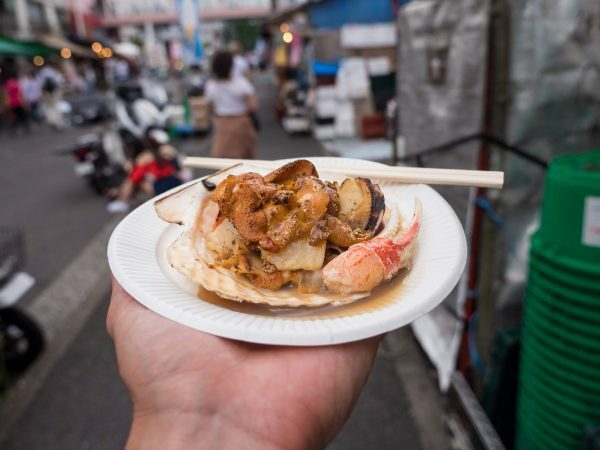 But in the evening, there are a number of food vendors that set up along the road, just outside the market. 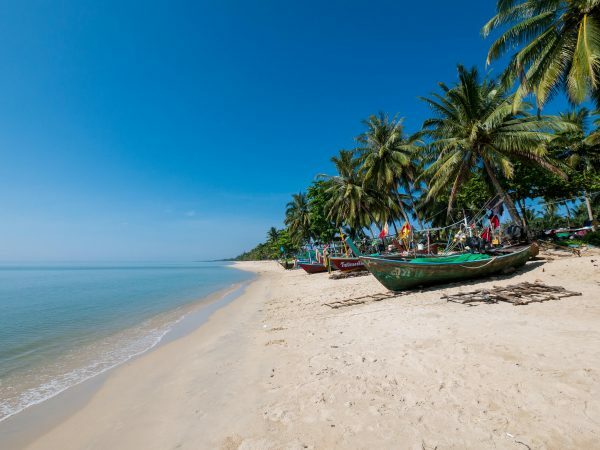 You’ll find mostly takeaway food, like Thai sausages, pre-made curries and stir fries, and other things like snacks and fruit shakes. Unfortunately there’s not much seating, so it’s not the best place for dinner, but it is a good place for some random stroll snacking. Warorot (ตลาดวโรรส) is probably the most well known market in Chiang Mai. You’ll find a variety of fresh fruits and vegetables, as well as a huge supply of Chiang Mai specialty snacks and traditional dishes. 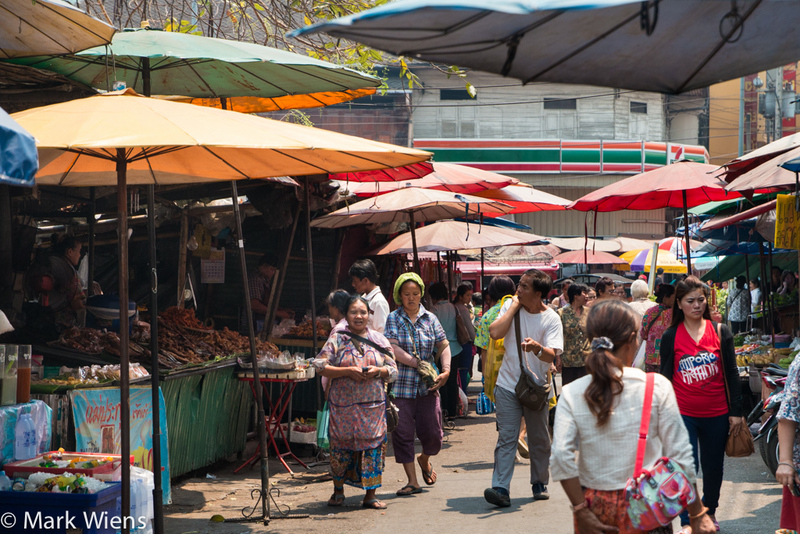 When you’re in Chiang Mai, especially if you love local markets, Warorot is a must visit. Also, if you love fried pork, I have to admit, the fried pork is extremely tasty at Dam Rong (ดำรงค์). 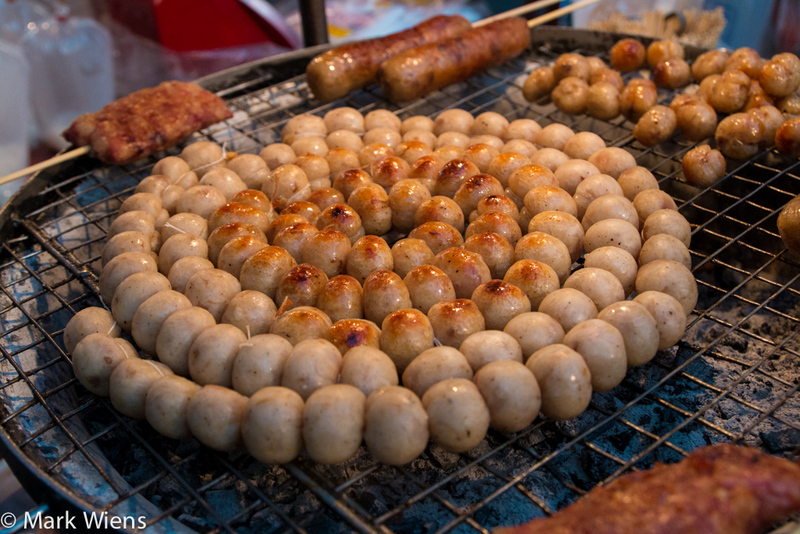 However, I prefer the sai ua (northern Thai sausage selection) over at Ton Payom market. 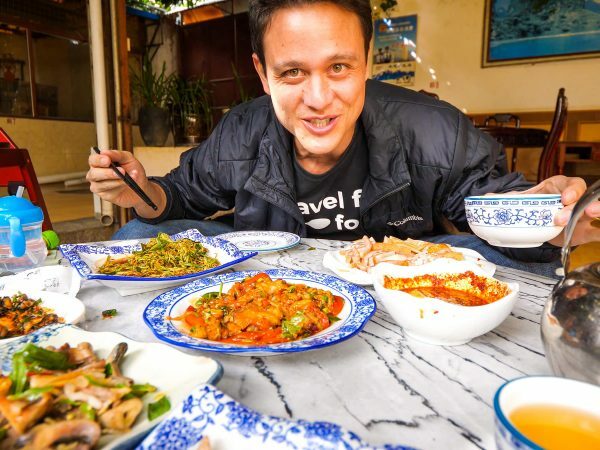 For more restaurant recommendations in Chiang Mai, check this out. How to get there: Warorot is one of major local transportation hubs in Chiang Mai, similar to Victory Monument in Bangkok, so getting there by local public transportation is always easy by rot songthaew (back of truck public transportation). 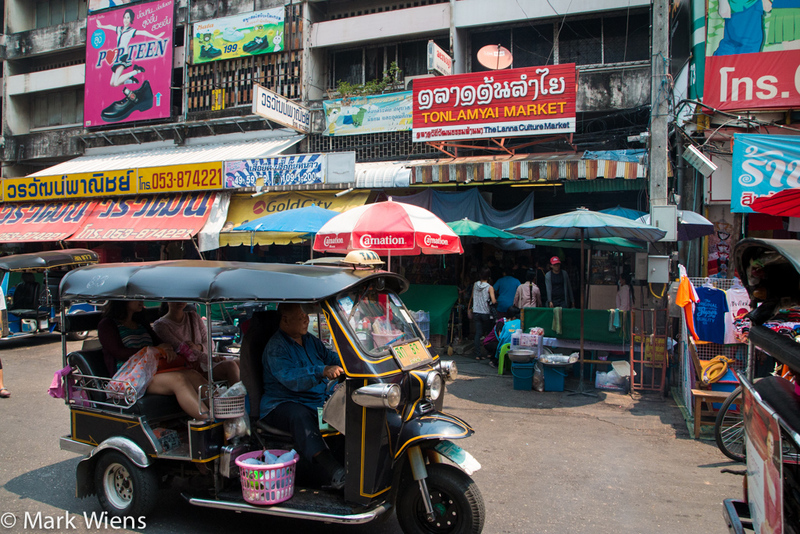 Alternatively, if you’re staying in central Chiang Mai, around the Night Bazaar area, you’ll have no problem walking to the market. For more details, check out my Chiang Mai map. Have you been to Warorot Market? I absolutely looove Warorot Market, so much variety of food to find here! And so true about the snacks 😉 I actually really miss the food in Northern Thailand, hope to return next year sometime and re-explore! Love Wararot market and the near by fabric stores are sooo cheap . Hey Aster, awesome to hear that, this is some amazing fried pork! 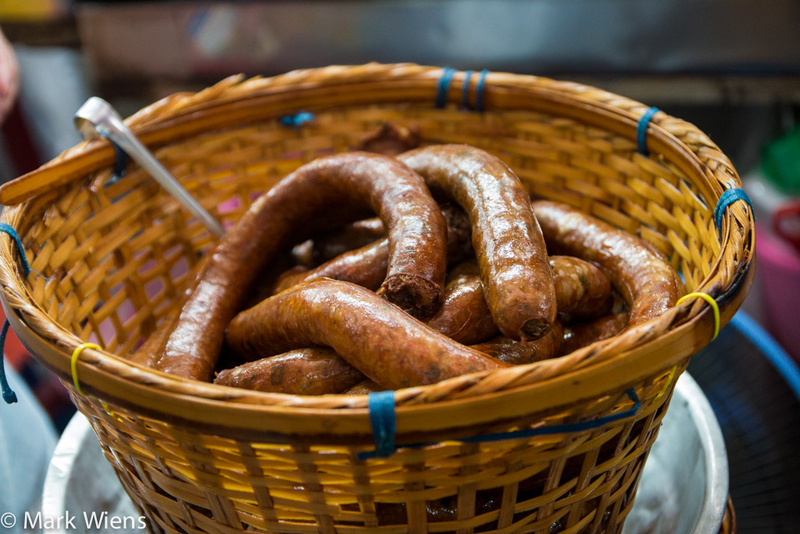 Went to the markets yesterday, and waited on a short line to get everything from the sausage/fried pork stall. Also got fried pork chunks as well as the red and green chilies. Everything was delicious! That green chili was spicy but still flavorful, and the fried pork chunks was our favorite! The sausage had decent flavor and some red pepper flakes inside so it’s a little spicy as well. Overall, thanks so much for the recommendation! Hey Jiaying, so glad you enjoyed it! Hi Mark, thanks for the suggestion. 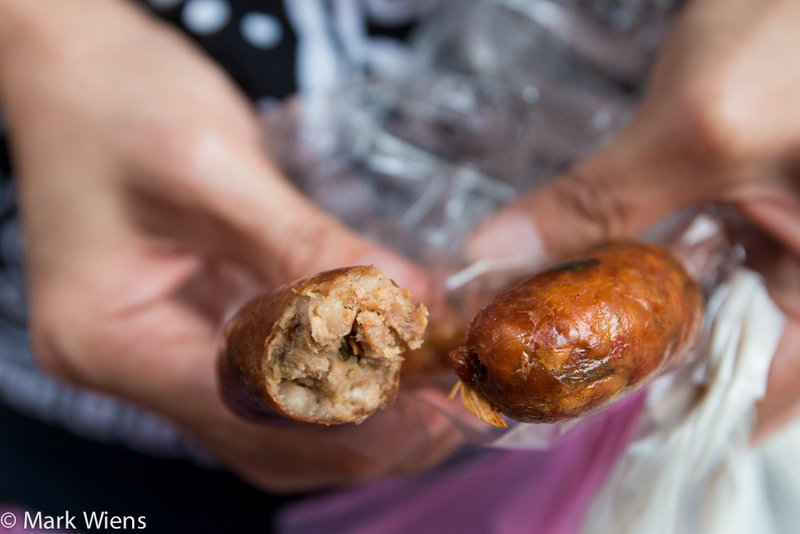 I tried the sausage and fried pork today and it was delicious with the sticky rice. Great to hear that Ken, glad it worked out. I had everything from the pork store and can say it was all delicious. I am now salivating thinking of it. Hi Karen, glad you enjoyed it! Hey Ian, good to hear that, everything is available at this market! Hey Alex, thanks, I will have to try that next time! oh the hustle, bustle, smells and fab finds of the market. 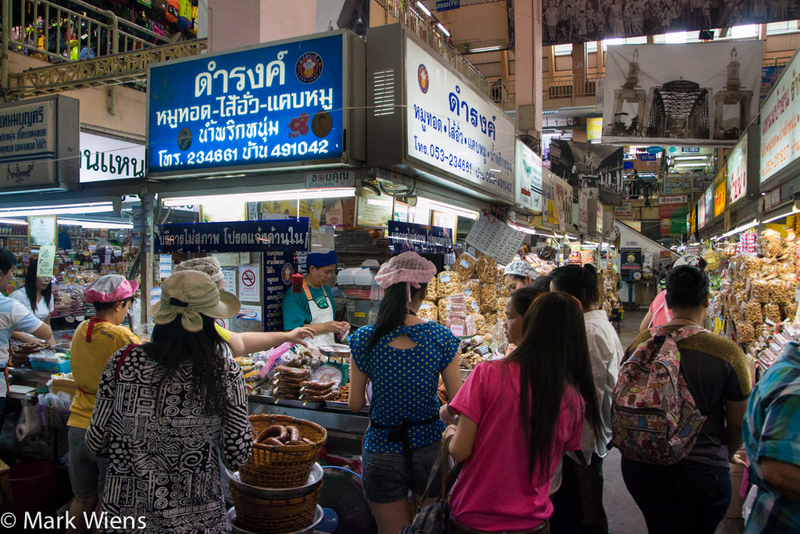 I’ve not been to this market but have been to others in SE Asia that sported a similar feel. Love it! Mark you did a great job at capturing the energy. Thank you very much Maria. Visiting markets is such a great place to learn about and explore a destination. Hey Bruno, thank you very much, hope you can visit Thailand soon. In your photo titled ‘Produce Vendors’, what were those leaf-wrapped cubes next to the limes? Hey Anwesha, that thing in the banana leaf could be a number of things, but I think it’s a preserved meat sausage like “naem” but I’m not fully sure.